Despite the Apple iPod outselling every other digital music player on the market, analysts are predicting that Apple will see its first decline in iPod revenue this year. The popularity of Apple's lower-end iPod models, the iPod nano , and the iPod shuffle , meant that Apple sold more iPods than ever before, but at lower prices. 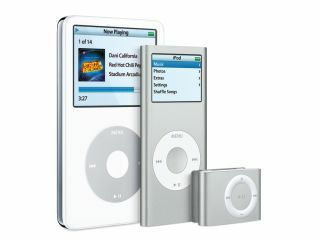 Bernstein Research analyst Toni Sacconaghi estimated that Apple sold 17.5 million iPods during the fourth quarter of 2006, a 25 per cent increase from last year. He added that it was likely that many of the iPods were sold at lower prices than before. "We believe the first ever year-on-year decline in iPod revenues may be unexpected for some investors," the analyst wrote in a research note. Sacconaghi estimates that the average sales price dropped by 22 per cent, from $207 (£105) to $161 (£82), in the holiday quarter compared with a year ago. Apple's $79 iPod shuffle accounted for 21 per cent of all iPod sales in the US in November, figures from the NPD Group showed. The iPod nano made up 51 per cent of iPod sales during the month. Wall Street analysts expect overall Apple sales to increase 12 per cent, from $5.8bn to $6.4bn (from £2.9bn to £3.2bn), compared with a year ago, according to Thomson Financial . Apple is expected to report its net income rose to $682.2bn (£346bn), or 78 cents per share, from $565bn (£286.5bn) a year ago.